Life after limb loss requires preparation for multiple transitions of mind, body, and spirit. 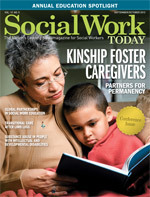 Social workers use their expertise in identifying and connecting patients with resources to assist and support them through the challenge. Exactly 100 days after the horrific Boston Marathon bombings, Marc Fucarile was headed home from Spaulding Rehabilitation Hospital—without his right leg above the knee. Fucarile also broke his spine and bones in his left leg and foot, ruptured both eardrums, and suffered severe burns and shrapnel wounds when one of the bombs exploded near him and a group of friends at the finish line as they watched another friend complete the run. He was the last of the wounded to check out, but his journey of recovery is far from over. Both rehabilitation and surgery will continue to be part of his future, and adjusting to life after limb loss can be a long process. Although Fucarile realized he would be a long-term patient with an ongoing road to recovery, the day that he would eventually check out of Spaulding was always at the forefront of his care. Spaulding focuses on transitional care planning, and putting resources in place for patients to thrive at home is a priority from day one. With a great number of adjustments needed to return to daily life after rehab, transitional care planning can be especially important for patients after limb loss. Under the transitional care model, the focus is on what’s needed to get the patient home as soon and effectively as possible. That means assessing the patient’s potential needs at the time of admission and utilizing ongoing consultation and assessment throughout the patient’s stay to remain on track for those needs. Many of those who lost limbs in the Boston Marathon bombings did not immediately go home. After hospital discharge, they began inpatient physical therapy, but the process of ultimately transitioning home already had begun through transitional care. Any sort of counseling for trauma patients requires some special considerations, which was the case for those treated after limb loss from the Boston Marathon bombings. Potter believes that all social workers should learn more about posttraumatic stress symptoms and treatment because they never know when they’ll encounter a patient who has experienced trauma. “It’s also important to recognize that debriefing after a group session of counseling can traumatize the other patients who didn’t experience that same type of trauma. In these situations, social workers should encourage generalities instead of focusing on the gory details,” she says. The trauma center is a program of Riverside Community Care, a private nonprofit mental health agency funded by the Massachusetts departments of public health and mental health to respond to critical incidents. It has a small full-time staff that has trained more than 800 people statewide to respond after disasters or other traumatic events. During the three weeks after the bombings, Riverside deployed 34 trained responders who provided psychological first aid and coping groups for more than 600 eyewitnesses, runners, first responders, business owners, employees, and residents of Boylston Street. There’s a risk of experiencing PTSD symptoms for patients who undergo any type of trauma, including the loss of a limb, according to O’Keefe. “Support for these patients includes mental health services, either through group or individual therapy. Antidepressant and/or anxiety medications can be helpful as well. In addition to assessing appropriate resources, the new amputee’s personality, coping skills, and even faith are variables that will greatly impact recovery rate and success. Social workers can help individuals identify positive coping skills and personality strengths that will assist individuals in recovering physically, emotionally, and psychologically,” she says. Omal Bani Saberi, LCSW, who counsels various patients in private practice in San Bruno, CA, including those who have above-knee bilateral limb loss and who is an above-knee bilateral amputee herself, says the psychological experiences of those with limb loss are very similar to those of grief and loss of loved ones. It’s also a loss that can have an effect beyond the patient. “Social workers need to be there to help guide and support the family members as they grieve with their father, mother, son, or daughter,” Saberi adds. There are definitely some similarities between veterans who have lost limbs as a result of intermittent explosive devices in war and those from the Boston Marathon attack. However, Potter says that one big difference is that veterans and law enforcement personnel often have a personal view that they “signed up for this and put themselves in harm’s way.” Because of those feelings, the recovery process may be more challenging for such patients. Even patients who have lost limbs in less traumatic circumstances need support, including mental health services. “Social workers must be aware that it’s not only patients who have been through traumatic events but anyone who has lost a limb that will need support and resources. Those who have lost a limb due to an accident or to disease are also undergoing an enormous change and experiencing the grieving process for the loss of that limb,” Johnson says. As patients begin the transition from hospital or rehab to home, social workers can make a huge difference by doing what they do best. “Helping people to identify and connect with long-term resources is something that social workers are tremendously good at and also one of the most important ways they can help during the recovery process,” McCauley says.